In this module the attributes related to the connection to the table in which the Form was created are defined. We can define the Primary Key, Filters, Sorts for the created form. On/Off : Adds or Removes the attribute that defines the primary key for the field. The field defined as the primary key will have an asterisk beside its name. All : Defines that all the fields are Primary Keys. The field defined as the primary key will have an asterisk beside its name. None : Unchecks all the fields. 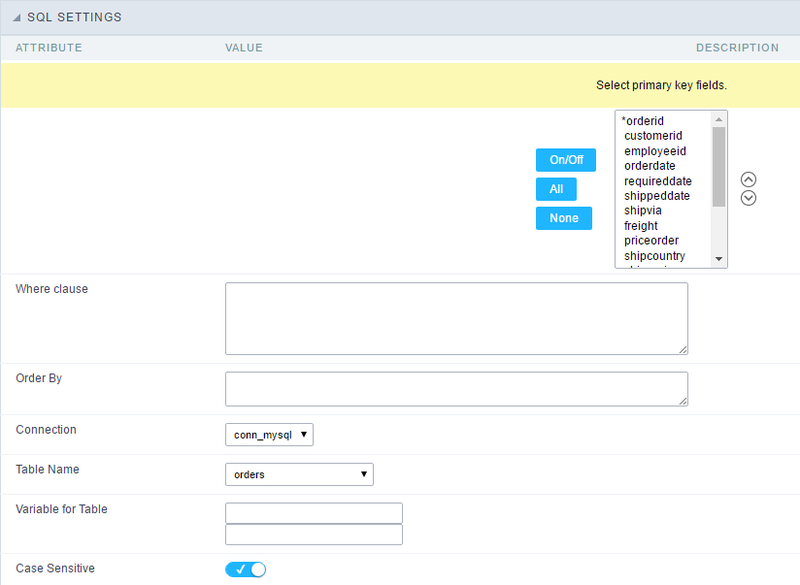 It removes the definition of the primary key for all fields. Sorting Button : These are the arrows on the right side of the Combo box. It allows to order the fields of the Primary Key, placing it in the desired order. To order click on the field and use the arrows to make the move. Where clause : An optional space that allows the user to place a Where clause with the objective to filter the SQL records. Order By : Optional space for the user to write the ORDER BY clause that will determine the order in which the records will be displayed, when the navigation bar is used by default, the order is determined by the Primary Key. Connection : Displays the connection name (database) that the application is using for its execution, this connection can be changed by another one that contains the same tables (SQL). Table Name : Name of the table that is being used in the Form. Variable for Table : These fields informed with value, allows part of the table name defined in the select to be changed before the execution of the command by a content of a variable. Case Sensitive : Allows you to configure whether the connection will be case sensitive or not. (Differentiating case).